Like his favourite author Hunter S. Thompson, creative writing student Tom Liberatore has always given off the vibe that he would not care if it all ended tomorrow. The air of indifference and his off-field antics have given rise to the question of whether football meant enough to Liberatore. But as his father Tony said on Monday, appearances can be deceiving. There is nothing like the motivation of a one-year contract and a second ACL reconstruction to spark that Liberatore competitive spirit. 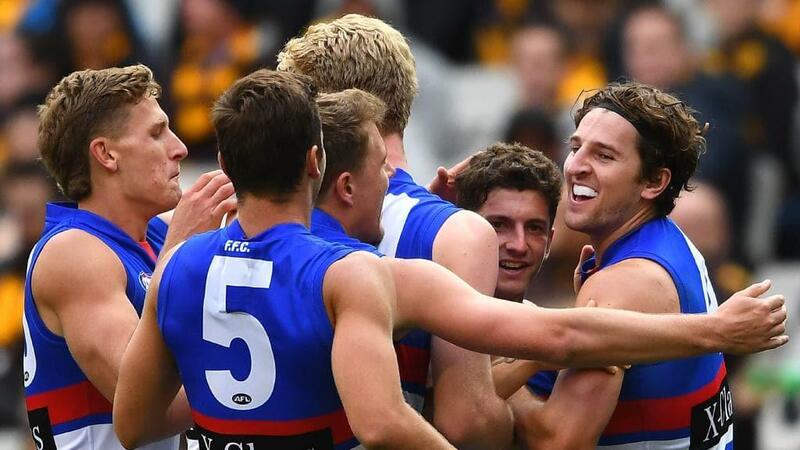 This year Luke Beveridge has got the band back together, and the popular Liberatore is its beating heart. Beveridge has backed in a group of five senior midfielders to become his centre square warriors, taking advantage of the AFL’s new centre bounce rules. And Liberatore has put up phenomenal numbers in the first fortnight as well as the kind of stoppage goals that broke Hawthorn’s resistance on Sunday. Liberatore has been in the centre bounce 28 times this year, with the Dogs winning 19 clearances in that time and losing just four. Beveridge’s gang of five are Jackson Macrae (35 centre bounces), Mitch Wallis (30), Marcus Bontempelli (28), Liberatore (28) and Josh Dunkley (27), with Bailey Smith’s six involvements the next best. Always a natural clearance player, Liberatore is being allowed to do what he does best after being pushed to half-forward at times through the 2016-17 seasons. It is only two game in, but he is so far averaging career highs in disposals (28 per game) as well as contested possessions, clearances and score involvements. Last year after a strong pre-season his knee crumpled, leading to a challenging rehab during which it was reported that his professionalism dropped away. Yet as Liberatore himself said, he has found the perfect work-life balance that involves training hard but also catching up with mates and adding another university subject to his load. He was so fit over summer that teammate Hayden Crozier said he led many running drills, with the game coming back to Liberatore given the added premium on centre square extracting. Father Tom was at the game on Sunday, thrilled that his son was back where he most wanted to be. “I always knew he would be able to come back,” Tony Liberatore said. “I don’t think I have missed many games in his whole career, my partner and I go and my 88-year-old mum comes along. I just think they have got that mojo back from 2016. “He is 26 now and he loves playing footy. He has that persona where it seems like it doesn’t really matter, but deep down it does. There is no doubt about that. “When he did his knee, it was pretty hard for him. I have done both knees too — left and right — and it takes a bit mentally to get back on track and do all the right things. Libba around stoppages and centre bounces is what the side lacked at times last year. Sign him up. Love Libba Snr, but it's a tad early to be mentioning 2016. Lid firmly on. Our 1954 premiership players are our heroes, and it has to be said that Charlie was their hero. Has been great so far Libba keep it going! So great to see him playing good footy. Why doesn't it surprise me that Libba is a Hunter S. fan. Saw these stats on Facebook yesterday. Got to be the biggest impact of any “new” player in 2019.